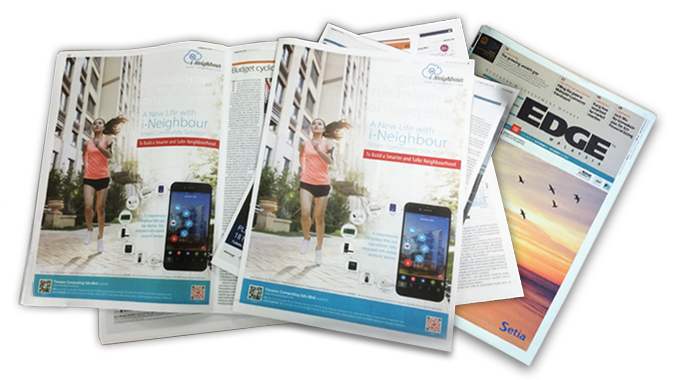 Did you catch i-Neighbour’s advertisement in The Edge, Focus Malaysia and The Edge Financial Daily? The ads were published in these Malaysia’s English business newspapers that feature on topics relevant within the Corporate Sectors, Property Sectors, Investment Sectors as well as covering a wide spectrum of readers ranging from property developers to dynamic individuals operating within the business industry. i-Neighbour is a cloud solution that integrates Visitor Management System, Residential Management System as well as an array of options for IoT Smart Security Series implementation all in one platform. What’s more, i-Neighbour is a system that is entirely developed and made in Malaysia. i-Neighbour was officially launched in April 2017. Users and neighbourhoods can now enjoy the benefits of this system for as low as RM2 per month, per household while visitors can access i-Neighbour for FREE via any web browser (PC or Mac) or through the i-Neighbour application available on the iOS App Store and Google Play Store. Visit i-Neighbour for more information.